A report by the Abaad Strategic Studies Center warned against the declination of peace opportunities and unprecedented increase of violence indicators. “The transition is at risk of failure because those in charge of the transition failed to take serious actions to meet the change demands and gain the trust of Yemenis,” the report reads. The report which was issued by the Strategies and future Visions Unit at the Center said that violence started to gain new supporters particularly among young men. It said that armed groups expands on the ground and they every day gain new influence amidst the government failure to achieve anything towards the state building. “There is alarming concern that shows Yemen slides gradually into the hands of violent groups and there is great fear that the Yemeni state will probably fall down soon if some armed groups worked out to take control of the capital Sana’a,” the report reads. The report presented a new statistic on the victims of armed operations carried out by armed groups against military and civil institutions since the NDC concluded on January 25th of this year. “The military operations by the army against the AQAP led to the death of 300 AQAP militants, 200 military personnel among them 15 officers and 30 civilians were killed in AQAP attacks during the same period,” the report said. The Houthis’ attacks against Amran city, the 310 Armored Brigade camp and other military checkpoints in Sana’a governorate and Al-Jawf resulted in the death of 400 military personnel among them officers including brigadier general Hamid Al-Qushaibi, commander of the 310 brigade. 250 civilians were also killed in the Houthis’ attacks whereas 2,000 Houthis militants were killed in their wars they launched against military and civil institutions since the NDC concluded over than half a year ago. The war carried out by the armed Houthis Movement ended with the takeover of the Houthis of Amran governorate. They are still in control of Amran despite the president’s visit and the government’s declaration of the Houthis’ withdrawal from Amran. The war destructed hundreds of houses, drove hundreds of thousands homeless and displaced others. One thousand civilians were also arrested by the Houthis. They (the Houthis) also blew up dozens of schools, mosques, offices of political parties, charitable societies and civil society organizations. The report said that many factors contributed to make Yemen transition in danger and unsafe. The main factor is the that the transitional authority is not aware of how this period is critical and they committed grave mistakes most importantly no quick practical actions were taken to impose the implementation of the NDC outcomes that are supported unlimitedly locally, regionally and internationally. “Three resolutions that the UNSC issued to support the political and peaceful power transition in Yemen were changed into useless in the views of Yemenis because they did not meet their demands in change and in transition. The resolutions are: resolution no 2014 issued on Oct 21st 2011, resolution no 2051 issued on June 2012 and resolution no 2040 issued on Feb 26 2013,” the report reads. The report criticized the deactivation of the last UNSC resolution on Yemen that included sanctions against transition spoilers under the 7th chapter of UN charter against the Armed Houthis group who took over a governorate and military camp in a war they carried out in Amran, Sana’a governorate that surround the capital Sana’a after their agreement on the NDC outcomes they took part effectively between March 18 2013 and January 25 2014. The non-use of sanctions after major violation of the NDC outcomes made Yemenis to fear that sanctions are just ink on papers and only used by local and international parties against certain change activists and political parties with no pressure on armed groups to put down weapons and exercise political action. “The tolerance towards the NDC outcomes implementation by the transitional authority can be interpreted for several possible reasons: disability and weakness to control the situation or indifference and unawareness of the threats or an attempt to bring about balance by weakening influence of some certain political forces in the state,” the report reads. “If the aim of decreasing some certain effective political and social parties has a national dimension to end fears of some armed groups to encourage their integration in politics, this will fruit in peace, but if it is not like that, this does not produce new influence for leaders of the transitional rule as they believe. It will just strengthen armed entities on the expense of targeted social and political ones,” it added. It said that the transitional leaders are the main responsible of the dangerous situation the transition experiences. The report highlighted the second factor that led to this dangerous transition in Yemen. “The expansion of sectarian armed militias represented by the Houthis in the north and their continuation of creating new reality by weapons, their expansion in Amran and large parts of Sana’a governorate and outskirts of the capital Sana’a plus Sa’ada which has been under their control since three years ago was the most dangerous threat against the transition. This dangerous step encouraged other armed groups affiliated to the AQAP and its local offshoot Ansar Al-Sharia to reemerge in an attempt to recapture towns in Abyan, Shabwa, Al-Baida and Hadramout,” the report said. “There is a clear equation of violence in Yemen where its parties interact with each other whenever the state does not enforce itself. The scene reoccurs constantly. When the Houthis took full control of Sa’ada in 2011, the AQAP took over the southern province of Abyan in the same period. And when the Houthis took over Amran and its military camps in this year, the AQAP attacks increased to take over the oil province of Hadramout, east Yemen,” the report said. The report said that the third factor that endangers the transition is the deteriorated economy. “The bad living standards, the increasing rates of poverty and unemployment and other economic burdens caused by the removal of the fuel subsidy with no actions taken to improve the economic environment such as: combat corruption, prosecuting former officials suspected of corruption, monitoring of the fuel smuggling in the black market, pursuing of sabotage groups that attack oil infrastructure and power wires have mistrusted the citizen in the state. This simplified the job of armed groups to attract and recruit many Yemenis, a thing which is alarming for the security situation in Yemen in the coming days,” the report warned. The confused external role in Yemen is the fourth factor that encouraged armed groups to expand, according to the report. “The UNSC and the ten-sponsoring countries of the GCC initiative took no practical actions against the transitional authority to sanction armed groups. The international community and the major states turned into monitors on the mounting violence in Yemen particularly following the developments in Syria, Lebanon, Iraq, Libya, Egypt and Gaza in Palestine,” the report reads. “The field and military status of the Houthis make them the first candidate among other armed groups to lead the state toppling. It is the most beneficiary of the current situation and the most well-prepared. After they [the Houthis] took control of Amran, they started sporadic attacks around Sana’a and the oil province of Al-Jawf and they simultaneously organized demonstrations in the capital Sana’a to show off their popularity and create a fracture at the civil and military levels in preparation to take over the capital Sana’a,” the report said. “They (the Houthis) have already started taking over the capital Sana’a and divided it into security quarters. They set up their own security checkpoints and they (checkpoints) are on rise whenever their weaponry stores increased , new armed are recruited and their influence over areas expanded,” the report said. It said that opportunities for president Abd Rabo Mansour Hadi go down day by day as long as he left the chance for Houthis to expand and militarize with no use of any practical pressures against them to end violence, put down weapons and exercise the political action. Abaad’s report expected that Yemen would plunge into a civil war that may destroy the country in case armed groups took control of the capital, adding that there are limited opportunities to save the country and using the 7th chapter through a military operation within an international alliance against the AQAP and Houthis positions may be the only possible resolution then. The report deemed President Hadi’s attempt to involve the Houthis in the government as the last resort to end war and establish the civil state. “However, such thing needs a set of procedures to ensure the Houthis will not use their involvement in the government to buy time and gain authority to control the state,” added the report. 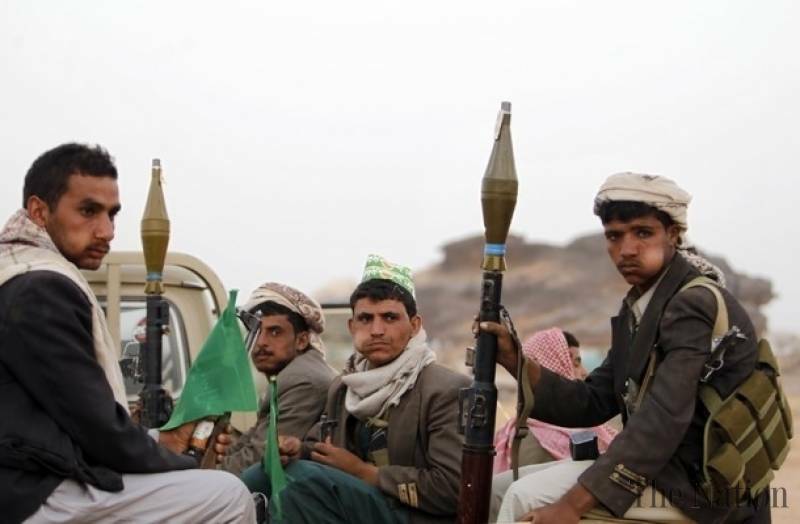 The report asserted that if the Houthis agreed to join the government without nominating official leaders of the movement for the positions allocated to them in the government such as selecting civilian people affiliated with the Houthis, or without making concessions to hand over Amran and Sa’ada to the state, without submitting their heavy weapons at least to show goodwill, it is just to buy time to continue their military escalation and preparations to control the state. The report proposed that the Security Council takes the initiative to supervise the national reconciliation in Yemen, mentioned in President Hadi’s initiative that included a code of honor including renouncing war, handing over heavy weapons to the state, ending sectarian and regional provocative actions, asserting that the initiative, which deems the NDC outcomes as a national standard, may be the last attempt to achieve the transition in Yemen. “The only guarantee that the Houthis would not explode the situation and topple the state is their capacity to have a national proposal coming from their Yemeni interests because the breakdown of the state does not lead to their control as they believe, but it results in fighting and destructive wars.” It said. “But if the Houthis continued to submit for the Iran which has no interest, but to keep on confusing action to compensate its surprise declined influence in the region as a result of taking part in marginalized wars resulted in the decrease of its influence in more than one country, the Houthis may fall in the false track of the Republican Guard that depended on using the force to resolve the situation in Iraq, Syria, Lebanon and they might repeat it in Yemen,” it said.